A few weeks back I carried out 3 days of the most gruelling but moving interviews of my recent career. I remember my agent laying it out for me at the very beginning. I was being asked to help 11 men talk about being HIV positive. Nothing could have prepared me for the intensity and exhaustion we would all feel during the long days of filming as we knitted together these eleven amazing, powerful and important stories. It turned out that the shirtlessness and busy set were not the only factors the stars of the show had to contend with. The location was a warehouse in a busy part of London, sitting directly below a thunderous flight path and gripped like a piece of tofu in chopsticks between a constantly rumbling railway line and a siren-polluted side-street. It is a testament to the patience and quiet tenacity of the Burger Productions film crew, the support of the background team and most of all, the gentlemen themselves, that we were able to make the films resonate with such honesty and emotion. The truth is, the distractions are standard on any shoot and they didn’t matter. If I heard an approaching train, plane or automobile I might have silently sworn at the ill-timing but then I’d see the man in front of me and the reminder was there: this matters too much to let a few noises get in the way. This guy is incredible and he’s got to have his voice heard. He’s talking about something that goes to the very heart of his life, his loves, his past, future and present…and the health and survival of his own exposed body. The short films show men of all ages and from around the world putting themselves in a vulnerable situation and showing themselves to be strong, in charge of their own health and excited about the future. That’s a message to be celebrated. We all hope their bravery and honesty will help other men to be aware that, while HIV is now a controllable virus, it is still a threat to your health in many often overlooked ways. Congratulations to the team at Gilead for creating such a smart, thoughtful and impactful campaign. So stay fit and healthy and please, watch the films. 25-year-old Riccardo comes from a small conservative town in rural Italy. He had his first gay relationship when he moved to London but was quickly told he was HIV positive. Riccardo’s parents supported him and tried to help him access the best medication. Today he says he’s planning to become a chef and look after his diet. Marcello is 45 and from Italy. He worked for a cruiseline, travelling the world. Then he fell in love. “I met someone. I trusted him. But then he forgot to tell me something…he was positive. Then a nurse found him and took his hand. “I told her ‘my life is finished’ and she took me in an area where people are diagnosed with terminal cancer and she said ‘you see you are lucky if you are doing the right therapy you will live a regular and normal life. It was a wake-up call. Bisi Alimi was diagnosed in Nigeria where both HIV and homosexuality carry a heavy stigma. In his video he remembers: “The moment the doctor looked into my eyes and said ‘you’ve got HIV’ I kind of resigned myself to the fact that I wasn’t gonna be around for long. Bisi had already risen to fame in Nigeria as an actor and then, incredibly, he decided to come out live on TV. He was beaten as a result and was told to flee the country. Graeme has a personality disorder and struggled with his mental health before and after his diagnosis but he says dealing with the virus has made him stronger. Antonis from Greece’s diagnosis couldn’t have come at a more difficult time. He found out he was HIV positive the day after losing his job and the day before losing his father. Antonis’s Father died of lung cancer from smoking but his diagnosis didn’t make him quite and start taking care of his over-stretched and broken heart. Watch more videos on youtube here and find out more about the campaign at the official website. Wojciech is 71 and from Poland. He was married for 15 years and has 3 children. He met his first gay love in Mexico in 1986 whilst on a work trip. His boyfriend told him too late that he was HIV positive and Wojciech waited 6 months before opening his test results. He was mugged in Mexico and came back to Poland for medical treatment. But Wojciech didn’t give up. 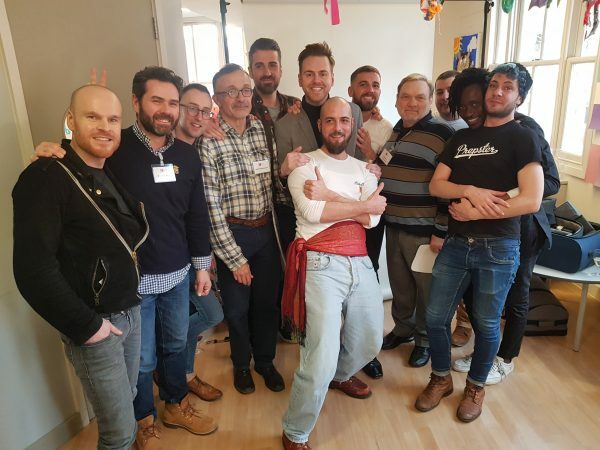 He became an HIV activist in Poland and made new friends and connections.